I had the pleasure to attend a women's leadership conference this past weekend. It was a fantastic opportunity to meet innovative and dynamic women from seven different decades, and I was so inspired by much that I saw and heard. But it was a lecture by a popular professor -- an expert in public speaking and issues of gender and communication -- that left me unexpectedly troubled. And it's taken me a couple days to figure out why. I last saw this professor lecture more than 20 years ago - and she's still the same funny, sharp-witted, and insightful speaker I remember from back in my college days. She urged us conference participants to be assertive, not aggressive, in our speech, to think about standing and sitting with confidence, to avoid lilting upward at the end of our sentences, to resist being cut off by others while we're speaking. All of this made a lot of sense to me. 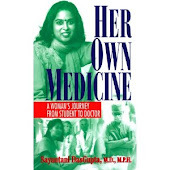 I know that women are often taught to defer to others in conversation ("no, no, you go ahead"), that we may unconsciously adopt physical postures of passivity or childishness (the cocked head, the crossed leg stance while standing), that we may sound as if we're apologizing, for even our names ("my name is Sayantani??"). "Don't wear skirts that are too short," she said, "And -- man or woman, if you're planning on crossing your leg at the ankle (a gesture men often do), please wear calf-high socks. There's nothing as distracting as a hairy leg - female or male." Ok, no hairy crossed legs, check. Seemed simple and logical enough. "Don't wear patterns, scarves, obvious jewelery or dangling earrings -- they distract from your face and your message," she urged. Ok, I guess I could see that, I thought, thinking dubiously of the patterned scarf I was wearing, as well as the embroidered Indian top, the gold paisley shaped earrings - also from India. "Don't wear patterned clothing - I stick mostly to black, and perhaps one solid color to pop," the lecturer added. She was wearing black pants and a red blazer. That was the advice that continued to bother me. After all, just the night before, at the conference's formal gala, I was among one of few women in ethnic dress (a salwaar kameese, dupatta, and fancy jacket), and got nothing but compliments. It's a deliberate gesture of ethnic pride I often make at formal occassions, but it's also a practical one - my nicest and most dressy clothes are usually Indian clothes. Over the next few days, I began to wonder - do such pieces of advice eliminate personal style - either regarding speaking or dressing? Do they mandate an appearance of ethnic homogeneity? I mean, did Aung Sung Suu Kyyi or Winnie Mandela or Indira Gandhi (all powerful global women leaders and speakers) avoid patterns and jewels? In this rapidly shrinking global world, was it possible for all women to dress alike anyway? I approach this issue through a particular lens, of course, that of a woman of color, but also a woman whose parents are immigrants. I am also a woman who watched my own mother, who came to this country at the age of 19 and was quite a jeans-and-beads wearing hippie for a number of years, stop wearing Western clothes altogether. It was shortly after the racist 'dotbuster' incidents in New Jersey -- when a group of thugs who declared themselves to be 'dotbusters' were terrorizing people of Indian origin. My mother, determined to show solidarity and pride in her identity, went cold turkey - no more jeans, no more Western clothes. She's a widely known academic and activist, and often does public lectures and trainings and yet - she's always dressed in either a salwaar kamesee or sari, with, yes, a bindi on her forehead. Now, I understand, both my mother, and now, I , are academics and there are obviously different expectations regarding dress and public presentation in many professions. Corporate America or television journalism are less forgiving re: presentation style than a university, or a creative business. Yet, I have an aunt who is an attorney who has developed her own style of professional dressing for the courtroom - a dark colored cotton sari topped by a suit jacket. And obviously, corporate women in India and other countries surely wear different styles of professional dress. I too am usually found with at least one piece of Indian clothing on my body - a flowing kurta on top of dark pants, topped by a blazer or jacket. It's my style, my interpretation of professorial dress codes, and I think, like my mother, it also reflects something political -- an identification with my roots and origins that I'm not willing to give up. Might a woman wearing a sari at a podium get a different reception than a woman wearing a dark suit? Perhaps. I guess it depends if the podium is in New York or Topeka, Washington or New Dilli. But isn't that difference in reception one worth challenging and interrogating? I guess my point is - ethnic dressing, like standing straight, meeting people in the eye when I talk, and not apologizing for my point of view, is actually a form of assertive communication on my part. It's a personal choice - just as any other woman's style of professional presentation is her personal choice. And honestly, even if if I dress like Hillary Clinton or Madeline Albright, no one's going to be mistaking me for them any time soon. If people are prejudiced against me for dressing ethnically, will they be any less so if I put my brown skin and Indian face in Western clothing? I hazard an assertive no. Like the question mark I keep trying to keep off the end of my sentences, I don't want to apologize for looking, and sounding, like exactly who I am. people should wear what they're comfortable wearing. those who judge on the basis of clothing are rarely worth hearing. 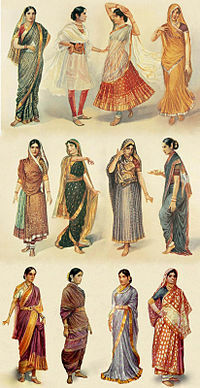 if women get to wear only what they or men think will make women fit in among men, then women will never be equal (likewise, nor will indians, africans, or whatever other nationality that might be forced to conform to euro-american fashions). what could be more awesome than a business as richly and diversely attired as nature itself? As an American expat in India - and in a location where we're often asked to dress in Indian attire (my wardrobe defaults to salwar suits, with saris for formal events) - the idea of being able to dress respectably and respectfully in these clothes is important to me. I consider it a high compliment when I'm told that I walk naturally and look good in my saris; the Western idea of "fashion" and "business dress" simply cannot, and often does not, take into account the views and other cultures that exist. It's not just a form of communication, but also respecting the culture you're in (in my case) or acknowledging your heritage; the idea that it might be inappropriate or unprofessional simply smacks of ethnocentrism to me. Thanks for your comments, hijabeng and pahariyommem! Great points about clothing requirements and ethnocentrism, many thanks for making them! Thank you for the beautiful information you have shared .It is helping me a lot.INDIANTHEME is the platform that provides you the dealers who can provide you some best deals that will be very beneficial to you definitely. , Designer sarees and many more So just visit www.indiantheme.com and get more benefits in your dealing.You will get to know that how easy and how conveniently you can buy your willing article in just a single click. Nice post. It really appreciated with this post intoWomen Ethnic Wear and Indian Ethnic Wear for Women. Quite impressing topic and it is beautifully described. The most important thing is, to Buy Indian Sarees Online is a very easy task nowadays. All point of the blog is very impressive. Thanks Gown Online Shopping In India. Awesome post about the dressing styles for women. I really like this blog. I recommend to continue to write many more topics on south indian sarees, wedding sarees online, premium sarees, office wear sarees to drive more visitors to your blog. Thanks for sharing!! Nice post! Aurelia kurta that has wide range of collection for women's. nice your article very informative your post. Printed kurtis are best to wear in every season. Buy now the awesome cost Cotton Printed kurtis Online at feasible price. If you want to get Rajasthani Wedding Dresses then these dresses are available at Rajvesh only. Buy now. A nice post about online ethnic sarees wear. Thanks a lot for sharing new type of saree attire in India. Winner! Peter and the Starcatcher Tickets!